Medicine Delivered at the Speed of Sound! Last week was busy with several after-work activities. One of these evenings was spent with Blacksburg Physical Therapy, reviewing musculoskeletal ultrasound. But first, I should explain that I have known this amazing group longer than any other physical therapy group, and they have always impressed me. For example, when a patient has a particularly difficult time in rehabilitation, we will do a “co-visit”- which is when the physician and the physical therapist meet the patient together and review the rehab plan. Also, we have done training together on Postural Restoration Institute courses and practiced Manual Medicine together. So when they asked me to come review Musculoskeletal Ultrasound, of course I said YES! At first, I went over my standard spiel on examination of the shoulder. But that quickly devolved and soon everyone was looking at everyone else’s various musculoskeletal oddities, like the distal biceps pain of the professional powerlifter. This group quickly figured out how Ultrasound is very efficient, diagnostic, and has lots of applications in the therapy setting. This allows us to quickly evaluate shoulder pain; but also, foot, ankle, knee, hip, elbow, wrist and hand pain. In this world of instant social media, selfies, Tweets, etc, musculoskeletal ultrasound allows the physician and patient to instantly see what inside the body looks like and how it reacts with motion. MRI can’t even do the things that Ultrasound can! But it does take a lot of training; and as the leading musculoskeletal ultrasound physician in the New River Valley, I feel excited to introduce this approach to as many providers who could benefit from this technology. 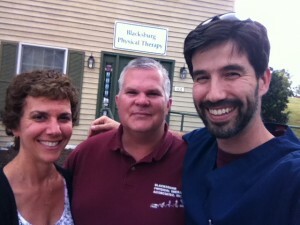 Thanks again, Blacksburg Physical Therapy, for a great evening. Keep practicing. This entry was posted in Education, healthcare, Medicine, Ultrasound, Uncategorized and tagged Blacksburg, Dr. Ethan Colliver, ultrasound, Valley Sports and Spine Clinic. Bookmark the permalink.